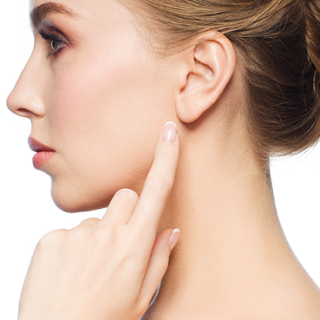 Otoplasty simply means surgery to change the shape of the ears. While correction of prominent ears is the commonest procedure – this term applies to any operation to reshape the ears and would apply to cosmetic reshaping of the ear lobe & careful repair of torn ear-lobes where ear-rings have been dislodged. The remainder of this advice sheet relates to prominent ear correction (the commonest otoplasty carried out). Earfold - What is it? Earfold – What is it? This is an exciting introduction because it is likely to open up the option of corrective surgery to many ‘less bothered’ patients who have not been inclined to go through 2 hours of surgery to have a correction, but may consider 20 minutes of having this fitted (it is fired into place with a small delivery gun). Indeed, many more mature adult patients may now reconsider having a correction with this option. Also, trial clips can be fitted over the skin in the clinic consultation to give a good preview ‘what you see is what you get’ idea of whether it may give an acceptable result for the patient looking in the mirror. About 60-70% of patients are likely to be suitable to have the device fitted. Unlike conventional otoplasty surgery, there is NO need to wear a bandage or head band after having Earfold fitted. Data presented by the London inventor Dr Kang on 403 patients showed 0 recurrences of ear prominence and a lower total complication rate (8.1%) than conventional otoplasty: (14.7% with cartilage scoring; 27.8% with suture techniques; 8.8-38% with combined cartilage scoring and suture techniques). In 2016, the London co-inventor had fitted 212 implants to 134 patients with 1 of 134 causing significant bruising, 5 of 134 mildly visible (the initial clips were grey, now they are gold plated), 4 of 134 requiring removal (2.9%) giving a total complication rate of 9/134 patients (6.7% total). Mr Blackburn is the first surgeon to introduce this to Spire Cheshire hospital – having been trained as one of the first phase of implementers for Allergen. Only trained and validated surgeons can be supplied by Allergen with Earfold devices. Who is conventional Otoplasty surgery for? This is an operation designed for those with prominent ears (‘bat ears’ or ‘sticking out’ ears) who would prefer for them to be set closer to the head. It is most commonly performed for children between the ages of 7-14 giving consideration to the age they may become socially stigmatised i.e. school age. It can be performed for adults who are self-conscious about prominent ears. The ear prominence may be on both sides or one side may be more prominent. Your particular procedure will be selected according to your particular presentation and discussed in the consultation. In general terms: the procedure may be performed under general anaesthesia or local anaesthesia. The incision is generally placed behind the ear – but some techniques require a small incision in front of the ear too. The cartilage folds inside the ear are then re-shaped – or a small piece is removed – and sutures (stitches) placed to hold the new position and close the wound. In some cases this allows the ear to lie in a new position closer to the head and this is all that is required. In other cases, additional sutures (stitches) are required in the groove behind the ear to anchor the ear closer to the head. What does conventional otoplasty surgery not do? What does otoplasty surgery involve? What happens after the surgery & what is the recovery time? A head bandage will be placed at the end of the operation which must stay on for a week day and night and will be removed in the clinic. At that time, the ears will still be a little bruised and swollen (for a total of 2-3 weeks) but most of the result will be visible at that stage. It is important that you continue to wear a supportive head band at night for a further 4 weeks after surgery to help support the new ear position during this early phase of healing. As with all surgery, there is a small risk of infection and bleeding. A haematoma (blood under the skin) – which requires evacuation by the surgeon – is uncommon (less than 1% of cases). The most common unwanted effect is that the ears may not be perfectly symmetrical – and further correction to achieve a perfect result may not be possible. The incision behind the ear may form a hypertrophic (lumpy) scar – this occurs in up to 4% of cases). The skin of the ear can be numb or tingling after the surgery – which in most cases returns to normal over time. All surgery carries complications – but this procedure has become well established because it is largely a successful and common operation. Relaxed atmosphere for the procedure. Being informed of progress during the treatment was reassuring. No pain just slight discomfort when anaesthesia wore off. Surgical outcome was excellent. Quick and painfree. Calming manner of staff was particularly good. Thank you so much for changing my life. I am so much happier in my life with so much confidence. I had many questions and Mr Blackburn answered all of them in detail and with great understanding.